It's the year 2010. A conversion, over an awesome meal and a few drinks too many culminates into a company that manufactures special lights at a small suburban studio in Mumbai. Design ideas pop-up from games played, a trek in the Himalayas, beat up home appliances and exotic travel. 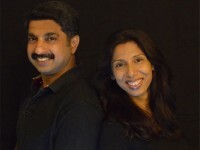 This soon results in Jovita and Carl Mascarenhas, a husband and wife duo, giving up a flourishing, corporate gifting solutions business and teaming up with close pals to launch Shady Ideas. Since then, the studio has expanded into massive work spaces that manufacture close to 3000 lamps every month. Oh yes, those awesome meals still happen and the few drinks still turn out to be one too many!!! Cool, suave, sophisticated are the words that best suit Carl. He spends 80% of his time scouring the gallies of Mumbai looking for raw material for our lamps. He is our "sourcer incarnate". In the other 20% he does product design, talks to clients and meddles in everyone's work. Before he founded Shady Ideas, Carl ran a company that manufactured corporate gifts, before which he ran a design & print company, before which he paid heed to Mark Twain and didn't allow his schooling to get in the way of his education. Jovita is the "crazy" of Shady Ideas. Always in control, every lamp has to have her approval!!! She gives creative direction to projects, handles finances and runs the place like a well-oiled machine at all times. She hates multi-tasking, keeps forgetting things. Hence, keeps making notes and then keeps forgetting where she has put those notes. Jovita has a basket list which includes sky-diving in South Africa. Her true love is exploring the world. We ship our products through reputed courier services only. If the product appears to be damaged at the time of delivery please get back to us within 7 days.